Although not ‘technically’ a committee member, Taina’s influence on the ML scene is palpable. In actuality, Taina runs her own dance organisation, entitled ‘Would You Dance?‘ which offers intensive classes for those that are looking to step up their Lindy game. Although she would be reluctant to say it, she is a dance NINJA (all capitals – on purpose) and the only follow I have seen dance in stilettos without looking like an inebriated Bambi-on-ice-given-the-once-over-by a-Zamboni-machine. 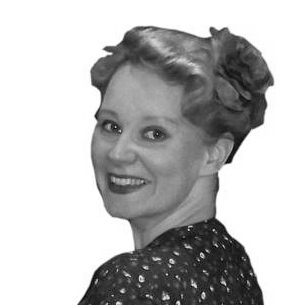 She was also Paula’s first ever Lindy teacher (talk about an endorsement) so when she moved to Manchester in 2011, Manchester Lindy jumped at the chance to have her guest teach! Three years later (she is still not sick of us) she is still enlightening many a dancer and lighting up the dance floor! Let’s say there are a lot of side effects I wasn’t expecting, like teaching people to dance instead of being a lawyer, being on stage & TV and meeting Lindy Hoppers literally from all over the world. I’m on the look-out for on-coming traffic both when following and leading! It’s magic and stuff happens which feels physically impossible. For example: Argentinian Tango dance where we span on top of the same penny. How it happened, not a clue. To differentiate from other swing dances I’d say: Bounce, nice & even! I really need to see the solid foundation, without it no amount of decoration will help. Fred Astaire – Tap. For rhythm & being grounded, all round amazing. Frida Segerdahl – Lindy Hop. For rhythm, being grounded, as follower being full-on in the dance with charisma. Peter Loggins – Balboa. For rhythm, being grounded, smooth with finesse. Only if you ignore the lead & follow or your partner. In a dance form which is based on improvising between two people you can’t really make a ‘mistake’ in the steps / moves per se. The main idea is that we dance to the song playing at that precise moment – so I would love MORE SWING music in Lindy events for Lindy Hoppers. Probably syncopated spin footwork with extra spin Not to fill the last beats of the phrase would be a crime, and if I’ve been lead to a spin, then more spins it is! Anywhere with a friendly crowd and good Swing music.